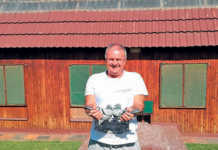 All went well at the prestigious Dinokeng One-Day Loft International Pigeon Race, says Thomas Smit. The word Dinokeng means ‘place of many rivers’. The loft is situated east of Pretoria in the bushveld surroundings of the Dinokeng game reserve. Most road training flights for the 2014 Dinokeng One-Day Loft took place without mishap; the pigeons were not exposed to the early morning winter breeze, and the flock benefited from clear visibility and warm temperatures similar to those of the final race. Few losses were experienced. Money Spinner (ZA PSWU 2013 01184), Jan Venter TRB (SA). Crusaders: Crusader Kiki (ZA 2014 19534). Rina (ZA NFS 2014 04751), Danie Hattingh. 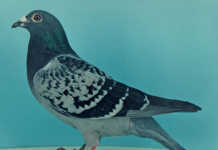 The Dinokeng Ace Pigeon 2014 (Best Bird) was determined by adding the velocity of every bird (calculated at m/ min) during the Super Turbo races and the main race. The winner was Hataman, with an average speed of 7 377,9m/min. A one-day loft is a privately- or SANPO-owned racing pigeon loft supervised by an expert trainer. Fanciers enter young racing pigeons into these lofts to compete for prize money. 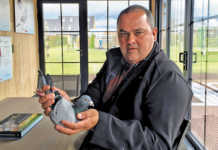 Pigeons are homed and trained according to a pre-planned programme to prepare them for a grand finale that carries the bulk of the cash prize payout. Prior to the final, several ‘money races’, called Hot Spots, are held during the longer training flights. Often, prize money is equal to that of the entry fee. A fancier may opt to send a three-bird team to the loft. One or two pigeons will be main entries, and the remainder reserve/s. Reserves may be activated by paying an entry fee. Prior to the final event, the public may enter pigeons not activated by the owners.